On Tuesday, 30th of May 2017, Her Majesty Queen Máxima of the Netherlands, in her capacity of the UN Secretary-General’s Special Advocate on Inclusive Finance for Development, made a field visit to the Horti Dalat project in Vietnam. Queen Máxima visits Vietnam from Tuesday 30 May through Thursday 1 June. The country is developing a national strategy for inclusive finance to promote adequate, affordable and sustainable access to financial services. The strategy's aim is to improve the economic position of the Vietnamese people and foster development. In Vietnam only 1/3 of the adult population has access to formal financial services. From people living in rural area's 75% lack access. One of the themes of the visit is value chain finance in agriculture. After the field visit in Da Lat, Queen Máxima will return to Ho Chi Minh city for a meeting with representatives of agricultural businesses and civil society organisations about the financing of agricultural activities. 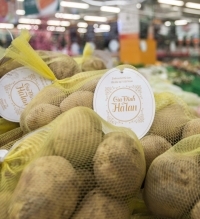 Within the framework of the Horti Dalat project new modern vegetable production technologies were introduced to local farmers. Through the development and introduction of a new type of financial product, interested farmers were able to apply for a loan to invest in these technologies. Through intensive coaching of the first pilot farmers by the consulting and R&D company named Fresh Studio, farmers have been successfully adopting these new technologies by increasing their production and income significantly. The first six pilot vegetable farmers used the loan to invest in protected cultivation (greenhouses) and fertigation systems. These commercial loans are a new type of non-secured loan, which is disbursed to carefully selected experienced vegetables farmers, with a convincing business case and cash flow plan. This innovative financial product for the Dalat area was developed with support of the Rabobank Foundation and disbursed to the farmers through Sacombank. Fresh Studio provides the technical support to the farmers and monitors their financial performance to limit risks and to ensure farmers are successful with their investment. During the field visit Queen Máxima discussed with the project farmers, Rabobank Foundation, Sacombank, the supermarket chain Mega Market and Fresh Studio about their experiences with access to finance in the Horti Dalat project. In a personal talk with Queen Maxima, pilot farmer Mr. Toan explained how this new financial product allowed him to get a loan, without having to mortgage his land. As a result of this investment, he has been able to increase his income 3 to 4 times, and will be able earn his investment back within 3 years. 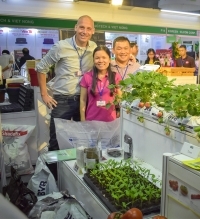 With the positive results of the Horti Dalat project, Rabobank Foundation and Sacombank agreed to expand their horticulture financing model to more Vietnamese farmers. Fresh Studio will assist Sacombank in the process of farmer selection, business planning, farm monitoring and training of the farmers in using the new technologies. To further upscale inclusive financial services for farmers to invest in modern horticulture production, Rabobank Foundation, Sacombank and Fresh Studio are exploring additional partnerships for cooperation with other parties and are optimistic that the visit of Queen Máxima will contribute to this. Modern vegetable production can provide a solution to meet the fast growing demand for year round available high quality, safe and sustainable produced vegetables. The region around Dalat City (Lam Dong Province) with its unique climate is the most important horticulture area of Vietnam, supplying the fast growing cities with fresh produce. Although quite some developments in horticulture production took place, especially in flower production, the vegetable production sector is still characterized by smallholders with little knowledge of modern vegetable production technologies, or the means to invest in these technologies. Introducing and showcasing modern horticulture production technologies in order to obtain higher yield, better quality and a more sustainable production system. 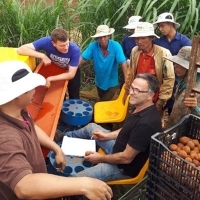 The Horti Dalat project partners are: Wageningen University, Rabobank Foundation, Sacombank, BVB Substrates, CMF, Da Lat University, HAS Hogeschool Den Bosch, Koppert Biological Systems, Rijk Zwaan, Ludvig Svensson, YARA, Priva and Fresh Studio. The project is supported by the Dutch Ministry of Foreign Affairs. Fresh Studio is the leading agriculture consultancy and R&D firm of Vietnam and Myanmar. Our mission is to make our clients successful in the sustainable production and marketing of food. Since 2006, we have worked passionately to achieve this mission and assist our clients to improve all practices from farm to fork. With a professional international and multi-disciplinary team of 80 staff, five offices, one food lab, two R&D farms, we are playing an important role in professionalising the agriculture sector in the region.